In Japanese cuisine, many delightful meals are made on an iron griddle. This style is referred to as teppanyaki. Once you understand the finer arts of teppanyaki, you can incorporate several different ingredients for the ultimate dining experience. Teppanyaki grills are often confused with the more commonly known hibachi grill, but there is a distinct difference. A teppanyaki grill is typically fueled by propane to heat a flat surface, whereas a hibachi grill will usually use charcoal with an open grate. 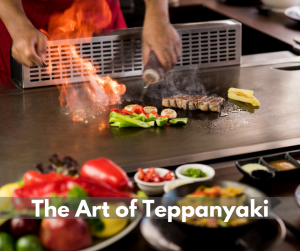 The word teppanyaki itself is a portmanteau of the Japanese words ‘teppan’ and ‘yaki.’ These words mean ‘iron plate’ and ‘grilled, broiled, or pan fried’ respectively. Okonomiyaki – Commonly referred to as the Japanese pancake, okonomiyaki is a savory meal, which includes many layers of noodles, egg, yam, shredded cabbage, and meat. Monjayaki – Similar in preparation to okonomiyaki, monjayaki has a thinner batter which makes it runnier, resulting in consistency on par with that of melted cheese. Yakisoba – Japanese for fried buckwheat, these delectable noodles are fantastic when served with vegetables and bite-sized pork. Japanese cuisine is rich with varying styles and preparations, but a teppanyaki meal is a must-have. At Shogun Japanese Steakhouse, we offer only the best and can ensure that your taste buds will thank you for our expert teppanyaki craftsmanship. Reserve your table today by calling 407-352-1607, and begin enjoying the best in Japanese cuisine.